The game that you will develop in this series is called Aliens, Go Home! The idea of this game is simple, you will have a cannon and will have to kill flying discs that are trying to invade the earth. To kill these flying discs you will have to point and click on an SVG canvas to make your cannon shoot. Nevertheless, this series includes links to relevant articles, posts, and documents that provide better explanations of topics that deserve more attention. Although the previous section has not mentioned anything about Git, this is a good tool to have around. All professional developers use Git (or another version control system like Mercurial or SVN) while developing, even for pet projects. Why would you start creating a project and don't back it up? You don't even have to pay for it. You can use services like GitHub (the best!) or BitBucket (not bad, to be honest) and save your code to trustworthy cloud infrastructures. Besides assuring that your code will remain safe, tools like that facilitate grasping the development process. For example, if you are using Git and you create a new buggy version of your app, you can easily move back to the previous code with just a few commands. Another great advantage is that you can follow each section of this series and commit the code developed on them in separately. This will allow you to easily see the changes proposed by these sections, making your life easier while learning through tutorials like this one. So, do yourself a favor and install Git. Also, create an account on GitHub (if you don't have one yet) and a repository to save your project. Then, after finishing each section, commit changes to this repository. Oh, and don't forget to push these changes. The create-react-app tool is popular, well documented, and well supported by the community. As such, if you are interested in learning its details, you can check the official create-react-app GitHub repository and its user guides. Don't forget to commit your files to Git! As you can see, the command above includes a third NPM package: react-redux. Although you could use Redux directly with React, this is not recommended. The react-redux package does some performance optimizations that would be cumbersome to handle manually. With these packages in place, you can configure your app to use Redux. The process is simple, you will need to create a container component, a presentational component, and a reducer. The difference between container components and presentational components is that the first simply connects presentational components to Redux. The third element that you will create, a reducer, is the core component in a Redux store. This kind of component is responsible for getting actions triggered by events that occur in your application and applying functions to change state based on these actions. If you are not familiar with these concepts, you can read this article to get a better explanation about presentational and container components and you can go through this practical Redux tutorial to learn about actions, reducers, and the store. Although learning about these concepts is highly recommended, you can still follow this series without reading about them. For now, your reducer will simply initialize the app's state with a message saying that it's easy to integrate React and Redux. Soon, you will start defining actions and handling them in this file. As you can see, defining what types your component is expecting is very easy with prop-types. You just have to define the propTypes property of the App component with the props that it needs. There are a few cheat sheets around the web (like this one, this one, and this one) that summarize how to create basic and advanced prop-types definitions. If needed, refer to them. You are done! To see everything working, you can head to the project root and run npm start. This will run your app in development mode and open it in your default browser. "It's easy to integrate React and Redux." As you will see in this series, creating SVG components with React is quite easy. In reality, there is almost no difference between creating a React component with HTML and with SVG. Basically, the only differences are that SVG introduces new elements and that these elements are drawn in an SVG canvas. Nevertheless, before creating your components with SVG and React, a quick overview of SVG may be useful. SVG is one of the coolest and flexible web standards. SVG, which stands for Scalable Vector Graphics, is a markup language that allows developers to describe two-dimensional based vector graphics. SVG is pretty similar to HTML. Both technologies are XML-based markup languages and work well with other web standards like CSS and the DOM. This means that you can apply CSS rules to SVG elements just like you would do with HTML elements, including animations. Throughout this series, you will create more than a dozen SVG components with React. 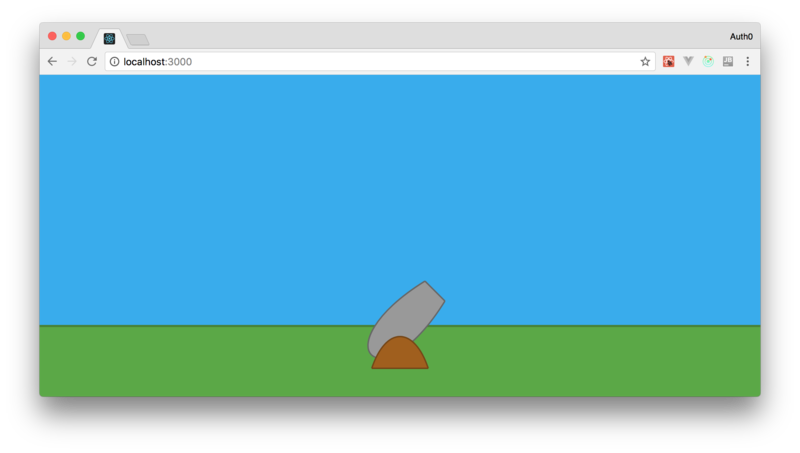 You will even compose (group) SVG elements to form your game elements (like the cannon that shoots cannon balls). A thorough explanation about SVG is out of scope and would make this series too lengthy. So, if you are looking forward to learning the details of the SVG markup language, you can take a look at the SVG Tutorial provided by Mozilla and at this article about the SVG coordinate system. However, prior to start creating your components, there a few SVG characteristics that are important to understand. First, SVG and DOM enable developers to accomplish great things when combined. This makes using SVG with React very easy. Second, the SVG coordinate system is similar to the Cartesian plane but upside-down. This means that negative vertical values are, by default, shown above the X-axis. The horizontal values, on the other hand, are just like the Cartesian plane (i.e. negative values are shown to the left of the Y-axis). This behavior could be easily changed by applying a transformation to the SVG canvas. However, in order not to confuse other developers, it's better to stick with the default. You will soon get used to it. The third and last characteristic that you need to know is that SVG introduces a lot of new elements (e.g. circle, rect, and path). To use these elements, you cannot simply define them inside an HTML element. First, you must define an svg element (your canvas) where you will draw all your SVG components. Drawing elements with SVG can be accomplished in three ways. First, you can use basic elements like rect, circle, and line. These elements are not very flexible, though. As their names state, they simply allow you to draw some simple shapes. The second way is to combine these basic elements to form more complex shapes. For example, you could use a rect with equals sides (this would be a square) and two lines to form the shape of a house. However, this approach is still limited. The path element accepts many other commands. Among of them, one of the most important is the Cubic Bezier Curves command. This command allows you to add some smooth curves in your path by taking two reference points and two control points. If you still don't understand exactly how Cubic Bezier curves work, don't worry. You will have the opportunity to practice during this series. Besides that, you can find a lot of tutorials on the web about this feature and you can always practice in tools like JSFiddle and Codepen. Now that you have your project structured and that you know the basic stuff about SVG, it's time to start creating your game. The first element that you will need to create is the SVG canvas that you will use to draw the elements of the game. If your run (npm start) and check your application, you will see that the browser draws just a quarter of this circle. This happens because, by default, the origin axis is rendered in the top left corner of the window. Besides that, you will also see that the svg element does not fit the entire screen. To make things more interesting and easier to manage, you can make your canvas fit the entire screen. You will also want to reposition its origin to be on the center the X-axis and to be near the bottom (you will add your cannon to the origin in a little while). To do both, you will need to change two files: ./src/components/Canvas.jsx and ./src/index.css. min-x: This value defines what is the leftmost point that your users will see. So, to make the origin axis (and the circle) appear in the center of the screen, you divided your screen width by negative two (window.innerWidth / -2) to the get this attribute (min-x). Note that you need to use -2 to make your canvas show the same amount of points to the left (negative) and to the right (positive) of the origin. min-y: This value defines what will be the uppermost point of your canvas. Here, you have subtracted the window.innerHeight from 100 to give some area (100 points) after the Y origin. width and height: These are the values that define how many X and Y points your users will see on their screen. Besides defining the viewBox attribute, you have also defined an attribute called preserveAspectRatio in this new version. You have used xMaxYMax none on it to force uniform scaling of your canvas and its elements. This will make both the html and body elements hide (and disable) scrolling. It will also make these elements fit the entire screen. If you check your app now, you will see your circle horizontally centered in the screen and near the bottom. You might be wondering why you are setting your game with such a huge area (width of 5000 and height of 1200). Actually, the width is not important in this game. You just have to set it to a number that is high enough to cover any screen size. Now, the height is important. Soon, you will force your canvas to show this 1200 points, no matter what is the resolution and orientation of your users. This will give your game consistency and you will know that all users will see the same area in your game. As such, you will be able to define where the flying discs will appear and how long they will take to go through these points. If you check your app now (npm start), you will see that your circle is still centered and near the bottom and that now you have a blue (fill: '#30abef') background color. Note: If you add the Sky element after the circle element, you won't be able to see the latter anymore. This happens because SVG does not support z-index. SVG relies on the order that the elements are listed to decide which one is above the other. That is, you have to define the circle element after the Sky so web browsers know that they must show it above the blue background. There is nothing fancy about this element. It's just a composition of a rect element and a line. However, as you may have noted, this element also uses a constant with the value of 5000 to define its width. Therefore, it might be a good idea to create a file to keep some global constants like this one. After that, you can refactor both the Sky element and the Ground element to use this new constant. To wrap this section, don't forget to add the Ground element to your canvas (keep in mind that you need to add it between the Sky and the circle elements). If you have any doubt about how to do these last steps, please take a look at this commit. You already have the sky and the ground elements defined in your game. Next, you will want to add something more interesting. Perhaps, you can add the elements that will represent your cannon. These elements will be a little bit more complex than the other two elements defined before. They will have many more lines of source code, but this is due to the fact that you will need Cubic Bezier curves to draw them. As you might remember, defining a Cubic Bezier curve on SVG depends on four points: the starting point, the ending point, and two control points. These points, which are defined in the d property of a path element, look like this: M 20 20 C 20 110, 110 110, 110 20. This code is quite simple, it just extracts four attributes (initialAxis, initialControlPoint, endingControlPoint, endingAxis) from a parameter called cubicBezierCurve and passes them to a template literal that builds the Cubic Bezier curve representation. With this file in place, you can start creating your cannon. To keep things more organized, you can divide your cannon into two parts: the CannonBase and the CannonPipe. Besides the Cubic Bezier curve, there is nothing new about this element. In the end, the browser will render this element as a curve with a dark brown (#75450e) stroke and will add a light brown (#a16012) color to its background. The code to create the CannonPipe will be similar to the CannonBase code. The differences are that it will use other colors and it will pass other points to the pathFromBezierCurve formula to draw the pipe. Besides that, this element will make use of the transform attribute to simulate the cannon rotation. Your game is gaining ground. You have created the background elements (Sky and Ground) and your cannon. The problem now is that everything is inanimate. So, to make things interesting, you can focus on making your cannon aim. To do that, you could add the onmousemove event listener to your canvas and make it refresh on every event triggered (i.e. every time a user moves the mouse), but this would degrade the performance of your game. To overcome this situation, what you can do is to set an uniform interval that checks the last mouse position to update the angle of your CannonPipe element. You are still going to use the onmousemove event listener in this strategy, the difference is that these events won't trigger a re-render. They will only update a property in your game and then the interval will use this property to trigger a re-render (by updating the Redux store). Note: You are going to call this action MOVE_OBJECTS because you won't use it to update the cannon only. In the next parts of this series, you will also use this same action to move cannon balls and flying objects. The new version of this file takes an action and, if its type is MOVE_OBJECTS, it calls a function called moveObjects. You still have to define this function but, before that, note that this new version also defines the initial state of your app to include a property called angle with the value 45. This is the angle that your cannon will be aiming when your app starts. This code is quite simple, it just extracts the x and y properties from mousePosition and passes them to the calculateAngle function to get the new angle. Then, in the end, it generates a new state with the new angle. componentDidMount: You have defined this lifecycle method to start the uniform interval that will trigger the moveObjects action. trackMouse: You have defined this method to update the canvasMousePosition property of the App component. This property is used by the moveObjects action. Note that this property does not refer to the mouse position over the HTML document. It refers to a relative position inside your canvas. You will define the canvasMousePosition function in a moment. render: This method now passes the angle property and the trackMouse method to your Canvas component. This component will use angle to update the way it renders your cannon and the trackMouse to attach as an event listener to the svg element. You will update this component in a while. App.propTypes: You now have two properties defined here, angle and moveObjects. The first one, angle, refers to the angle that your cannon is aiming to. The second one, moveObjects, is the function that is going to be triggered on a uniform interval to update your cannon. If you are interested in why this is needed, this StackOverflow thread is a good reference. CannonPipe.rotation: This property is not hard-coded anymore. Now, it's tied to the state provided by the Redux store (through your App mappings). svg.onMouseMove: You have added this event listener to your canvas to make your App component aware of the mouse position. Canvas.propTypes: You have explicitly defined that this component needs angle and trackMouse to be happy. That's it! You are ready to see your cannon aiming feature in action. Go to your terminal, in the project root, and type npm start (if it's not running already). Then, open http://localhost:3000/ in a web browser and move the mouse around. You cannon will keep rotating to follow your mouse. "I have created an animated cannon with React, Redux, and SVG! How fun is that!?" In the first part of this series, you have learned about some important topics that will enable you to create the complete game. You have also used create-react-app to bootstrap your project and you have created some game elements like the cannon, the sky, and the ground. In the end, you have added the aiming feature to your cannon. With these elements in place, you are ready to create the rest of the React components and to make them animated. In the next article of this series, you are going to create these components, then you are going to make some flying discs appear randomly in some predefined positions. After that, you will also make your cannon shoot some cannon balls. This will be awesome! The community has translated this article into Russian. You can find part 1 here, part 2 here, and part 3 here.